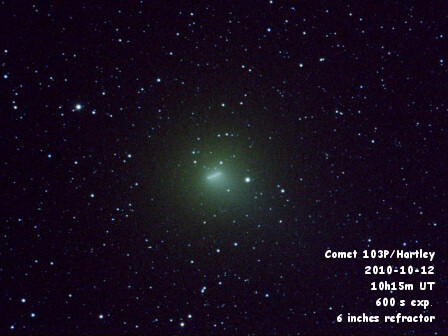 Comet Hartley 2, officially known as 103P/Hartley 2 is a small comet that orbits the Sun with a period of 6.46 years. It was discovered by astronomer Malcolm Hartley in 1986 using the Schmidt telescope in Siding Spring Observatory (Australia). It is estimated that its nucleus has a size between 1200 and 1600 meters, according to recent observations of the Spitzer Space Telescope (August 2008): its albedo, very small, is close to 0.028 as it is covered with very dark carbonaceous bodies probably hydrocarbons. The mass is estimated around 3 × 10 ^ 11 kg. In its approach to the Sun of 2010 is visible in the constellations of Cassiopeia, Perseus and Auriga, but could be visible to the naked eye in mid-October of that year from places with dark skies: it reaches its minimum distance from our planet on October 20th standing at only 0.12 Astronomical Units. A few days later, on October 28th, passes through the perihelion located a little over 157 million miles from our star. In their approach the year 2010 this image was obtained through a 6-inch refractor telescope. Its next step takes place on April 2017.